The human petrous bone in the skull protects the inner ear structures. Though it is one of the hardest, densest bones in the body, some portions (such as the area in orange, protecting the cochlea) are denser than others. Possibly because the petrous bone is so dense, DNA within the petrous bone is better preserved than in other bones. In some cases, scientists have extracted more than 100 times more DNA from the petrous bone than other bones, including teeth. Credit: Pinhasi et al., 2015, PLOS ONE. For the past few decades, new evidence about ancient humans—in the form of skeletal remains, tools, and other artifacts—has trickled in, inching us closer to an understanding of how our species evolved and spread out across the planet. In just the past few years, however, knowledge of our deep past expanded significantly thanks to a series of technological breakthroughs in sequencing of ancient human genomes. This technology can be used to find genetic links among populations of human ancestors dating back hundreds of thousands of years. In addition to advances in genomic technology, another factor is driving the explosion of new discoveries—an inch-long section of the human skull. Found near our ears, this pyramid-shaped portion of the temporal bone is nicknamed the petrous bone. The bone is very hard, possibly because it needs to protect fragile structures such as the cochlea, which translates sound into brain signals, and the semicircular canals, which help us maintain our balance. Perhaps because the petrous bone is so dense, it also is the bone in the body that best preserves DNA after a person dies. As a result, archaeologists are scrambling to study samples taken from this pyramid-shaped structure to unlock the mysteries of our species’ formative years. Leafing through my favorite biology textbook from a handful of years ago, I was struck by the relative brevity of the chapter on human evolution. While other fields of biological research have enjoyed a steady gallop of productivity over the last few decades due in part to advances in computing power, imaging technology and experimental methods, the study of human evolution can be seen as having lagged behind until recently due to an almost complete dependence on fossil evidence. Fortunately, contemporary biology textbook chapters on human evolution are being primed for a serious upgrade thanks to the recent availability of high-quality genome sequences from diverse modern human populations as well as from ancient humans and other non-human hominids, including the Neanderthals and Denisovans (but, for purposes of this story, not the Great Apes). 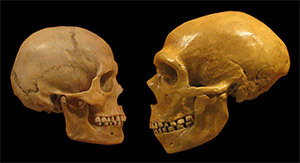 Modern human skull (left) and Neanderthal skull (right), shown to scale. There are not enough Denisovan bone fragments to reconstruct its skull. Credit: Wikimedia Commons, hairymuseummatt. What are the new resources for studying human evolution? The cost of DNA sequencing has dropped precipitously in the last decade. As a result, more complete human genome sequences become available for analysis with each passing year.